Happy Chanukah! We are in the midst of our celebrations and enjoying them even more than in years past. Sam is old enough to help light the menorah and Anabelle can unwrap her own presents. She can also express her opinions. The matching sweater and hat set garnered a loud “no” (as she threw it off back at me) while chocolate covered raisins won an immediate smile. Chanukah is a relatively new holiday for me as I was brought up Christian. Reuben was raised Jewish. Being the open‐minded, holiday‐loving couple that we are, Reuben and I celebrate both holidays. Unlike the fast and frenzied Christmas rush, I find the eight nights of Chanukah more relaxed and laid back and can’t see ever giving up the tradition. My mother‐in‐law asked me to make the main course for our big Chanukah dinner this year. I decided to try out this simple braised brisket recipe, which turned out to be the best brisket I’ve ever made. The dish is perfect for entertaining, even if you aren’t celebrating Chanukah. You can spend more time with guests since you don’t need to do much with the meat once it’s braising in the oven. You can even make it the day before. If you can’t find brisket, I bet this recipe would taste amazing with short ribs or chuck roast, though the cooking time might be shorter. Along with the brisket recipe, I’m posting my mother-in-law’s latke recipe. If you’ve never had latkes, they’re like potato pancakes, only better. I have no idea why we only eat them once a year. Preheat the oven to 300°F (150°C). Whisk the wine, broth, cranberry juice and flour to blend in medium bowl; pour the mixture into a dutch oven or roasting pan large enough for the brisket to lay flat in. Mix in the onion, garlic and rosemary. Sprinkle the brisket on all sides with salt and pepper. Place the brisket, fat side up, in the pan. Spoon some of the wine mixture over it. Cover the pan with its lid or, if using a roasting pan, tightly with heavy‐duty aluminum foil. Bake the brisket until very tender, basting with pan juices every hour, about 3 1/2 hours. Let the brisket cool in the sauce for 1 hour. Discard the rosemary stem. Transfer the brisket to cutting board; cool 1 hour at room temperature. Thinly slice the brisket across the grain. Arrange the slices in the pan with the sauce, overlapping slices slightly. The brisket can be prepared 2 days ahead. Cover and refrigerate. Preheat the oven to 350°F (180°C). 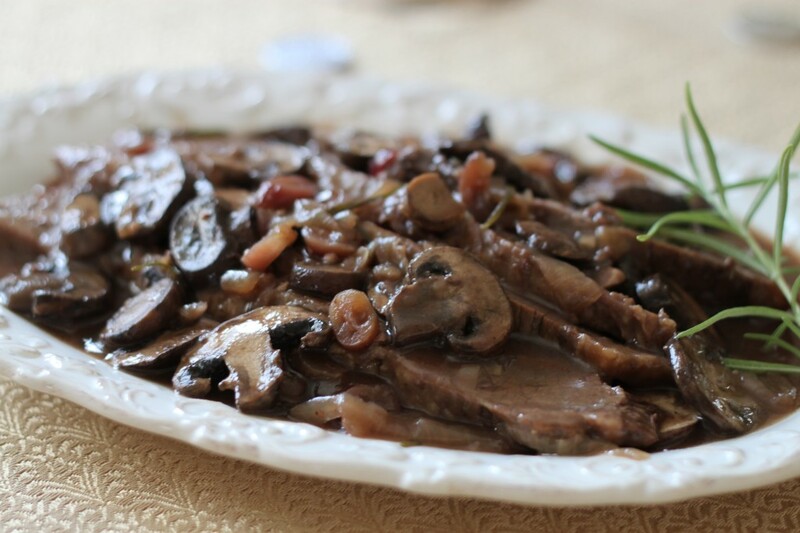 Gently stir the mushrooms and cranberries into the sauce around the brisket. Cover the pan and bake until the mushrooms are tender and the brisket is heated through, about 30 minutes (40 minutes if the brisket has been refrigerated). Transfer the sliced brisket and sauce to a platter and serve. Years ago, my mother‐in‐law wrote this latke recipe on a piece of Queens Botanical Garden note paper and sent it to Reuben and me. She correctly assumed I had no idea how to make them. The recipe has moved with us to a least four different residences, acquiring more oil splatters each year. I’ve added more instructional detail for those who have not witnessed latke‐making in person. Using a food processor or hand held grater, grate the potatoes and onion into a large bowl. Squeeze the lomn juice on the mixture so the potatoes don’t turn black. Let the mixture stand 30 minutes, covered, then drain the liquid out. Mix the flour, egg, salt, and pepper into the grated potatoes and onion. Heat oil (enough to generously cover the bottom of the pan by about a centimeter) in a large cast iron skillet over medium‐high heat. With a large spoon [or by hand if you have done this at least 20 years], place a pancake‐size pile of the mixture into the hot oil and press lightly. Three latkes will usually fit into the pan. Fry the latkes in hot oil about 4 minutes on each side until brown and crisp. Drain the latkes on paper towels or paper grocery bags. Serve hot with sour cream and/or applesauce.